Los Cabos, Mexico (July 12, 2017) – Pueblo Bonito Pacifica Golf & Spa Resort has amped up its guest experience with a series of exclusive, one-of-a-kind “happenings” designed to create exceptional vacation experiences and special memories. The Orchard Cooking Class, its name inspired by “La Huerta” (The Orchard) at The Market at Quivira (a purveyor of locally sourced organic produce), was created to appeal to avid “foodies” and would-be chefs. A maximum of eight guests are invited to participate in the open-air Orchard Cooking Class at Pacifica. Together with the Executive Chef, guests are encouraged to select and prepare vegetables and herbs for each dish. The chef then teaches guests how to create regional Baja cuisine, including favorites like roasted chilies stuffed with smoked marlin; an herbal vinaigrette that calls for finely chopped herbs grown in the hotel’s garden; and the classic “Tiradito Gabina,” seared fish cut into thin slices and served on a toasted flour tortilla with fresh garnishes. Once completed, the gourmet lunch is paired with well-chosen wines from Mexico’s Guadalupe Valley and served at a table set up beneath orange umbrellas Recipes can be taken home so that guests can reproduce the dishes in their own kitchens. Debuted last year, Hook & Cook, hosted by butlers from The Towers at Pacifica, invites guests to surf cast in some of the world’s richest fishing waters. “Even for novices, the butlers are very good at familiarizing guests with basic casting techniques,” Corpus said. “They work with guests to make sure they catch something,” typically sierra or roosterfish. 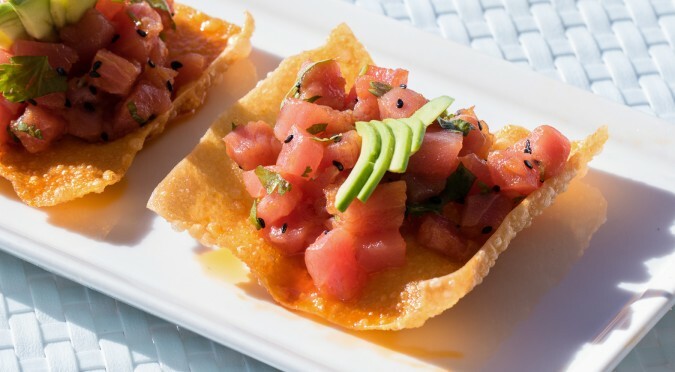 Even if there’s no action, the butlers ensure that fresh fish is always available to make the resort’s signature mesa de ceviches using the house-made emulsions and salsas. Sashimi is also popular. Hook & Cook is normally scheduled for Wednesday morning, but Corpus explained that if the tide brings in fish, “we alert interested guests that the fish are running!” He added that special catches can be taken to the Pescados or Peninsula restaurants for a cooked preparation. There’s nothing like a beachside clam bake for a fun, informal dining experience. The Clam Bake at Pacifica, staged on a pristine stretch of beach a stone’s throw from the ocean, is held on Thursday nights year-round. Designed as a pre-dinner “finger-food” event, guests are invited to sit around a natural fire pit on the beach, where the region’s famous Chocolata clams, drawn from San Carlos on the Pacific side and La Paz on the Sea of Cortes, are roasted over a mesquite fire. Also featured are a tempting array of hand-picked, fire-roasted root vegetables. Guests who want to experience an unforgettable gastronomic experience can order the Steak Flambé at Siempre, one of Pacifica’s most popular restaurants. According to Corpus, the prime New York strip steak can be enjoyed in one of two ways: cooked on hot river stones and flamed with mescal mezcal or prepared with Himalayan salt, which imparts a unique flavor profile to the meat. “It’s a spectacle,” Corpus said. “Guests who observe another table enjoying the Steak Flambé often order it themselves.” Both preparations, available every night at Siempre, are paired with an exquisite collection of national and international wines. The Mixology Class at Pacifica, invites guests to refine and expand their bartending skills with a master mixologist. Staged on Saturdays at the Peninsula Beach Bar, one of Pacifica’s most beautiful settings, the class is shown how to use hand-picked herbs and spices grown on property for Montiel’s creative concoctions, many of which feature Mexico’s most famous native spirits: tequila and mezcal. As at the Orchard Cooking Class, guests learn the appropriate salutation before imbibing: salud! (cheers). Montiel’s exceptional drink recipes can be recreated by guests back home. In terms of personal luxury, Pacifica’s Beach Bed experience is a perennial favorite, especially for couples who have slipped away to Los Cabos for some much-needed rest and relaxation. Spaced along the beach, these comfortable, shaded platform beds are secluded and provide a nice alternative to the pool. Guests can snooze in the shade, canoodle, and stay late to take in a glorious sunset. Eight blissful hours of personalized service are available to Beach Bed patrons, from a breakfast catered by the butler staff to an extensive snacks and cocktail menu, all delivered bedside with a smile. Rocking beds are also available. Nestled on a secluded 2.5-mile stretch of pristine beach in Cabo San Lucas, Pueblo Bonito Pacifica Golf & Spa Resort is an all-inclusive luxury resort catering exclusively to adults seeking a tranquil oceanfront hideaway. A modern yet elegant approach to design and architecture presents an ideal setting for a memorable vacation of relaxation and self-renewal. An award-winning resort and spa destination, the 154-room retreat features four restaurants, four bars, the Armonia wellness-inspired spa, 5,800 square feet of meeting and event space and access to a private beach as well as wine and tequila tastings. Coming December 2016, Pueblo Bonito Pacifica will unveil The Towers at Pacifica, three new ultra-luxury buildings that feature enhanced amenities and first-class personalized service, including 24-hour British Butler Institute-certified butler service to attend to any and all guest needs. The Towers at Pacifica will also include an exclusive VIP Towers Lounge offering culinary experiences and specialty cocktails, state-of-the-art gym and a new gourmet restaurant – all with dramatic oceanfront views. Pueblo Bonito Oceanfront Golf and Spa Resorts has eight award-winning resorts in two destinations, Cabo San Lucas and Mazatlán, all offering luxury all-inclusive options. Each of the properties has its own personality, design and ambiance, yet all share the same high level of impeccable quality and distinguished atmosphere. For more information visit ww.pueblobonito.com and find us https://www.facebook.com/PuebloBonitoResort and follow us on Twitter @PuebloBonito.